The Providence Opera House, a very large theatre built in 1871, featured theatrical productions and later films as well. It was the showcase for the Providence showings of D. W. Griffith’s “Intolerance” in 1918. It closed in March 1931 and was demolished not long after. Additional information about this legendary lost theatre would be greatly appreciated. 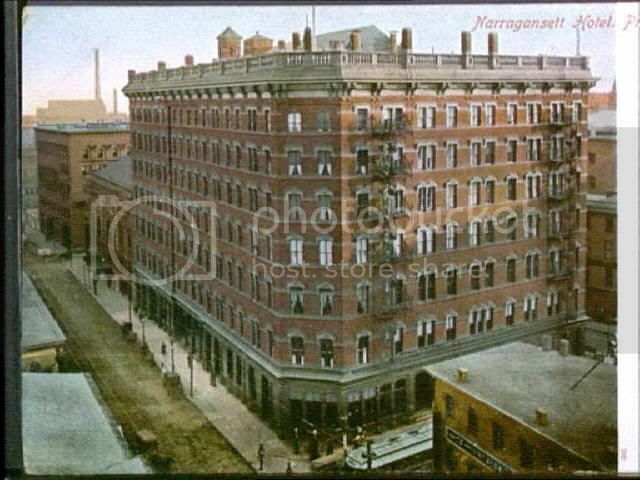 ONE: NARRANGASETT HOTEL NEXT TO OPERA HOUSE The Opera House would be destroyed in 1931 to provide parking facilities for the Narragansett Hotel. 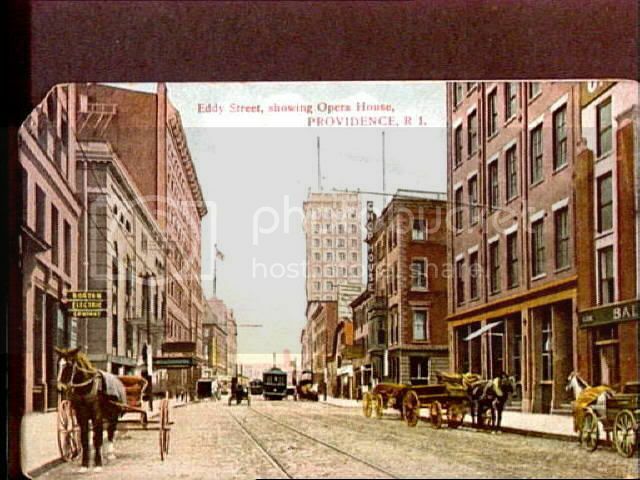 TWO: POSTCARD VIEW OF DORRANCE STREET, not Eddy Street as printed on the card. On the left we see the Opera House with the Narragansett Hotel to the right of it. The Opera House installed sound at the end of the 1920s, and in January of 1929 they were showing Erin’s Isle, “Ireland’s greatest story…motion picture with sound…music…melody…mirth." Adult prices 50Â¢ to $1.00. In little more than two years the venerable theatre woould be closed and razed. Note: in 1921 they had shown the film Ireland in Revolt about the uprising against British rule. Irish topics were apparently popular here and in the heavily-Irish city. 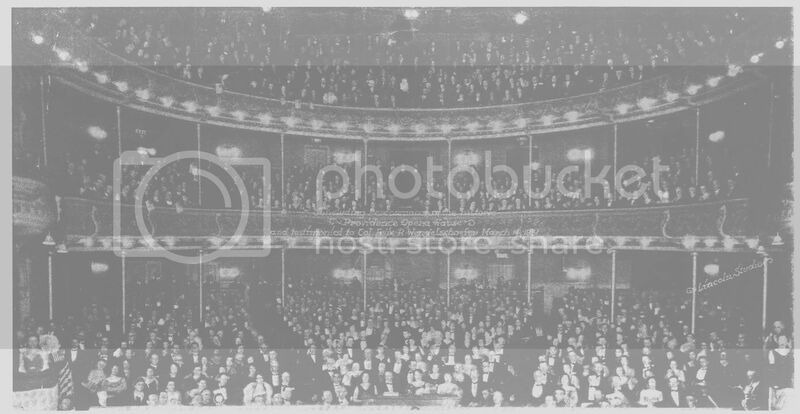 Audience at the final gala show at the Providence Opera House on March 14, 1931. Slightly better image of the above famous photo of the 1931 closing night. Another of the “big” movies that were shown at this legit house was the Fox production of What Price Glory, directed by Raoul Walsh, and starring Edmund Lowe and Victor McLaglen. It opened April 18, 1927. The film was accompanied by a “special symphony orchestra of 20” and there were two daily shows, at 2:15 and 8:15, with admission prices ranging from 50 cents to $1.65. The Providence Opera House is listed in the 1897-98 edition of the Julius Cahn Official Theatrical Guide, a reference book for roadshow producers and stage managers. The admission prices ranged from 25 cents to $1.30. 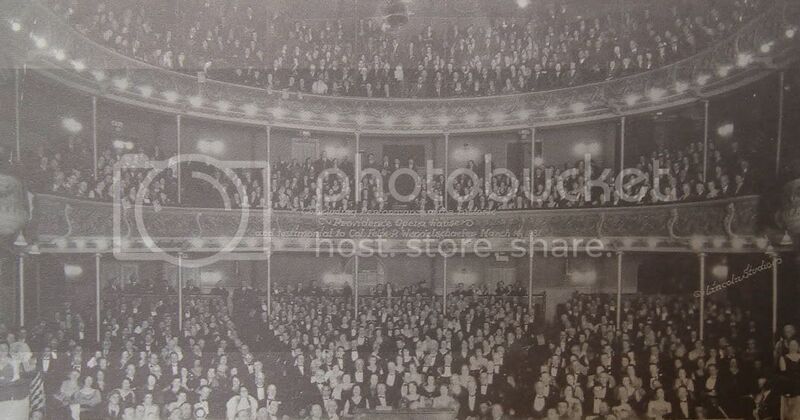 The seating was: Orchestra: 529, Balcony: 328, Gallery: 500, total: 1,357 plus box seats. There was room for 400 standees (what they call “admissions” in the Guide). The theatre was on the first floor, and had 10 places in the orchestra pit. The orchestra leader at the time was Felix Wendelschaefer. The Manager was Robert Morrow. The proscenium opening was 38 feet wide X 39 feet high; the stage was 45 feet deep. The Providence Opera House was later managed by the Shubert organization for many years. Here is the opening day ad for the Providence Opera House from the Providence Evening Press December 4, 1871. The first offering of the theatre was the comedy play entitled Fashion, by Anna Cora Mowatt.